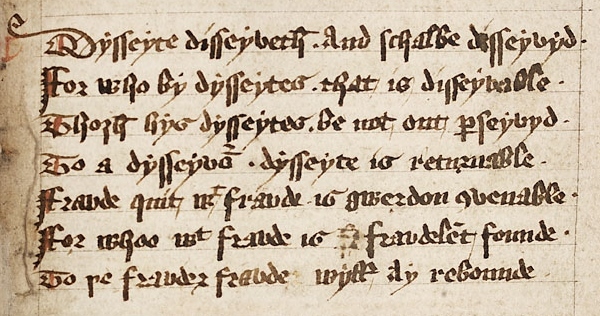 Here’s another love poem, this time a short lover’s lament (DIMEV 3269) from London, British Library MS Harley 913. Scroll down for a text and translation. MS Harley 913 is a trilingual mid-fourteenth-century anthology of poetry and prose, copied by a Franciscan friar living in Waterford in the south of Ireland. The poem narrates how love has brought the speaker into sinful thought, then to the absence of reason and reflection (which nonetheless proves futile as a means of escaping love), then into grief and anxiety, and then to despair. It ends with his resolution to continue even without hope of his lady’s favour until death and the grave.